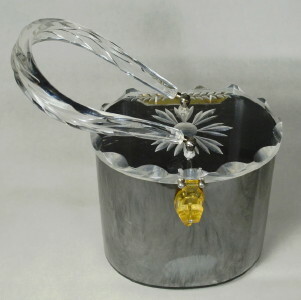 Fifties vintage RIALTO Lucite handbag. Gray marbleized (pearloid) and clear Lucite. Gray oval cylinder shape with flat back purse. Clear carved lid & handle. Ambered Lucite turn button closure. Four clear Lucite button feet. Silver tone hardware. A sophisticated fifties classic! EXCELLENT condition. Shows only small cloud mark just above bottom edge (see images). No odors, no breaks or chips, clasp closes securely.